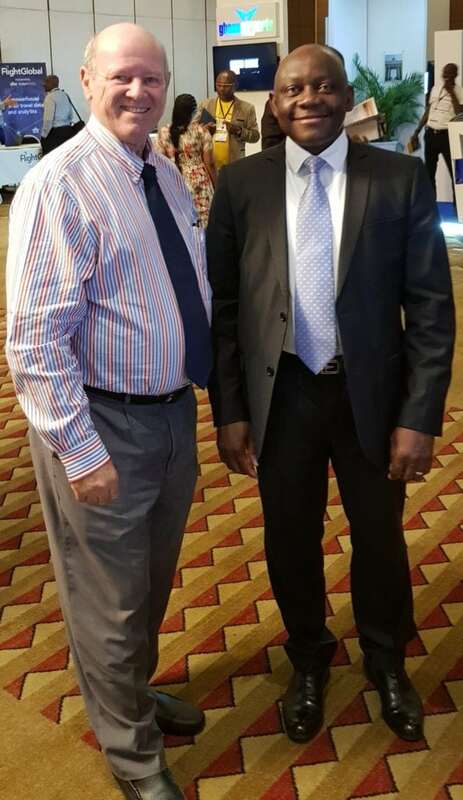 Raphael Kuuchi, the IATA’s Special Envoy to Africa on Aeropolitical Affairs and Alain St.Ange of Saint Ange Tourism Consultancy who is the former Minister of Tourism, Civil Aviation, Ports and Marine of the Seychelles said as they met in Ghana that the time is right for a joint Ministerial meeting of African Tourism and also of Civil Aviation Ministers. Raphael Kuuchi of IATA Africa believes that African Tourism and Aviation must stand behind this meeting because the current challenges faced by the continent needs to be tabled, discussed and addressed. “We from IATA Africa want to be involved and work alongside Brand Africa and the new African Tourism Board for the consolidation of Aviation and Tourism of our continent” said Raphael Kuuchi. winner of the 2018 AVIADEV (Aviation Development Conference) ATO GIRMA WAKE AWARD for his outstanding contribution to route development in Africa. Alain St.Ange said that he believes that Strict visa regimes in some Africa countries continue impede the ease of travel among Africans within the continent. “It has emerged for instance that an African citizen needs to have visa to be able to travel to at least 60% of countries within on the continent. The figure is the more staggering when one considers that 84% of African countries require visas from all nationals across the world”. The former Seychelles’ Minister of Tourism, Civil Aviation, Ports and Marines, Alain Saint Ange believes that governments could work together to streamline visa requirements that will ensure unnecessary barriers are done away with. St. Ange who was part of discussions on the topic, “Economic impact of tourism – tourism authorities and airports in partnership,” at the Routes Africa Conference in Accra, observed that it important that even in an era where technology contributes significantly to seamless travel, the human factor should not be overlooked. He said: We need to ensure that for the tourist, when he decides to visit, he can do his booking and get on the plane; today everything is online, we talk about everything being kept in Cloud 9, and with all sorts of technology. We need to allow people to work and when we’re allowing people to work, they will then visit countries. So opening up these gates that block people from travelling is to ensure that sooner or later, we have as less obstacle as possible so that travel and tourism can really work. It is a dream and we need to find one thing that rallies us to work more together.The one-time UNWTO Secretary General hopeful, admonished governments not to allow the motivation of cashing in on visa fees to prevent them from taking the right steps geared towards an integrated African continent. “I think the income factor has become a major factor today because whenever the discussion goes on the visa, they say well, we’re going to make such a loss so immediately, it shows you that the money is playing a part. But I think we need to rise above this, we need to look at how the economy of a country can grow by opening that door, stimulate the market, stimulate the business, and stimulate the industry. “When this is working, the people firstly, will benefit because you will have much more buoyancy in the market, then government will make out more from taxes, and then they’re back to square one of generating more and the people are happier because they are making money themselves instead of the consolidated fund.”, St. Ange empahsised. Newer PostIn honor of Mr. Mandela: How the celebration is ongoing in Johannesburg, South Africa?